6 years old. Mom just sent me to my room for “snipping at her” for who can remember what. I slam the door in a huff, yelling, “I hate you!” and “You’re not my mommy!” I stomp around he floor. I pound my fists onto the bed. I cry hot tears. I pull a black vinyl record out of its sleeve & place its hole over the pin of my portable record player, turning the dial up high. She’ll be sorry! 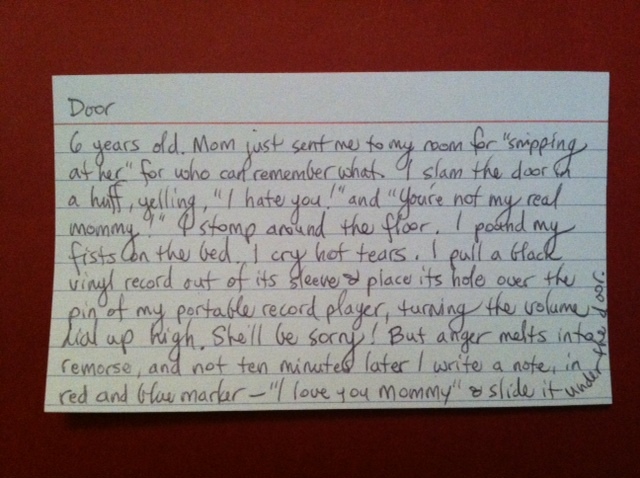 But anger melts into remorse, and not ten minutes later I write a note, in red and blue marker — “I love you mommy” — & slide it under the door. When we were kids, mom & dad paid us to do chores around the house. 10¢ to dust. 5¢ to clean the toilet. 25¢ to vacuum. It’s how we earned the money we needed to buy candy bars at the nearby grocery store, or, if we pedaled across the creek, at the 7-11. 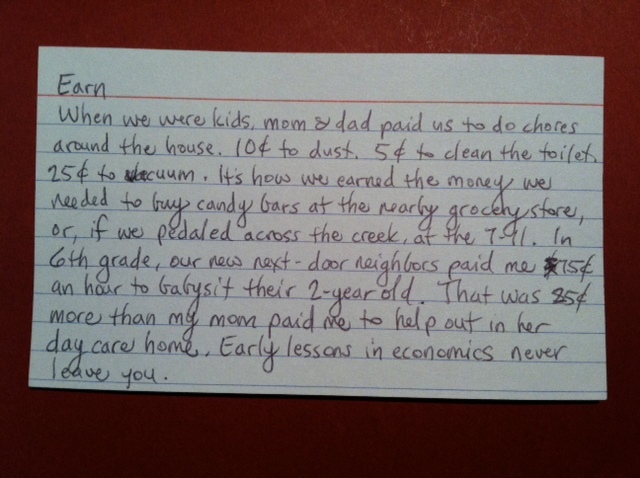 In 6th grade, our new next-door neighbors paid me 75¢ an hour to babysit their 2-year old. That was 25¢ more than my mom paid me to help out in her day care home. Early lessons in economics never leave you. 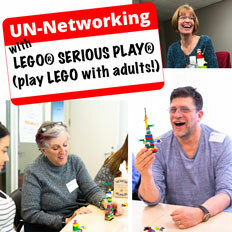 Note: Odd that two random words, today’s and yesterday’s, would share the first three letters! 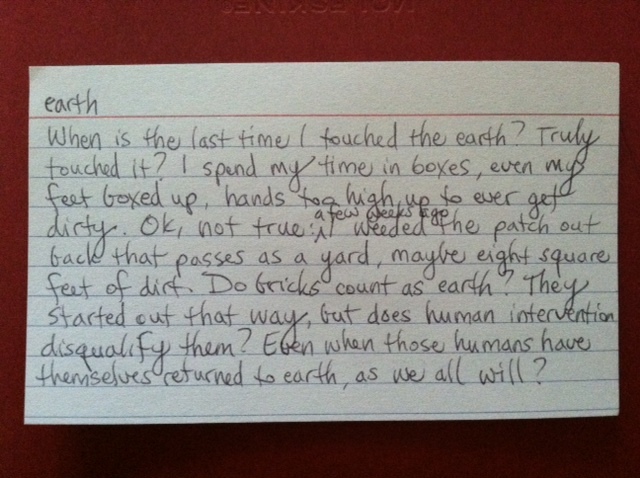 When is the last time I touched the earth? Truly touched it? I spend my time in boxes, even my feet boxed up, hands too high up to ever get dirty. Ok, not true: a few weeks ago I weeded the patch out back that passes as a yard, maybe eight square feet of dirt. Do bricks count as earth? They started out that way, but does human intervention disqualify them? Even when those humans have themselves returned to earth, as we all will? Now, as the darkness lengthens, leaves dropping from the trees, my feet and neck wanting wrapping, I steel myself for winter. Even in California we feel the cold (we appreciate subtlety here). Yes, I revel in pumpkins, persimmons, cozy sweaters not worn since last year, curling by a fire to the sound of raindrops on windows. But oh, the beguiling sweetness of an impossibly far off summer day. 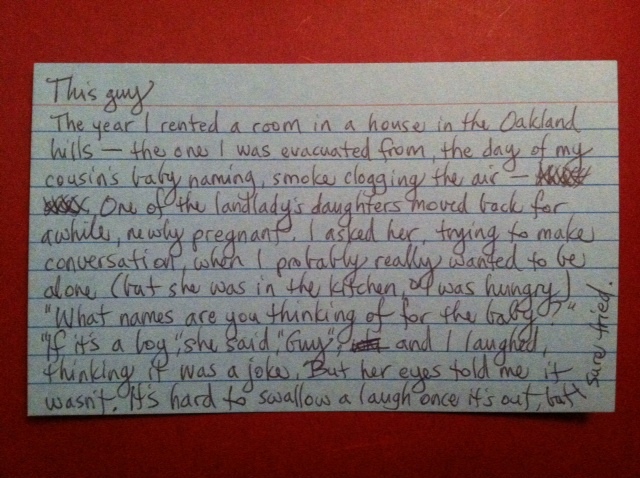 The year I rented a room in the Oakland hills — the one I was evacuated from, the day of my cousin’s baby naming, smoke clogging the air — one of the landlady’s daughters moved back for awhile, newly pregnant. “If it’s a boy,” she said, “Guy,” and I laughed, thinking it was a joke. But her eyes told me it wasn’t. It’s hard to swallow a laugh once it’s out, but I sure tried. Of course you would end up here, so totally off course from where you thought you were headed, the track laid out in your mind, but your bliss, your truth, your very heart derailed right off like the track was butter, scampering off into the distance, and though you persisted on that track you laid, wore it down to a grave-like rut, in the end what choice had you but to follow, grumbling at first, but then your slogging feet began, of their own accord, to skip, and dance, as if your very bones were filled with helium, and you caught up with your heart, and it sang. Of course. This morning I opened up to a random page in 1000 Songwriting Ideas, by Lisa Aschmann, closed my eyes, and stabbed my capped ballpoint pen down on the page. 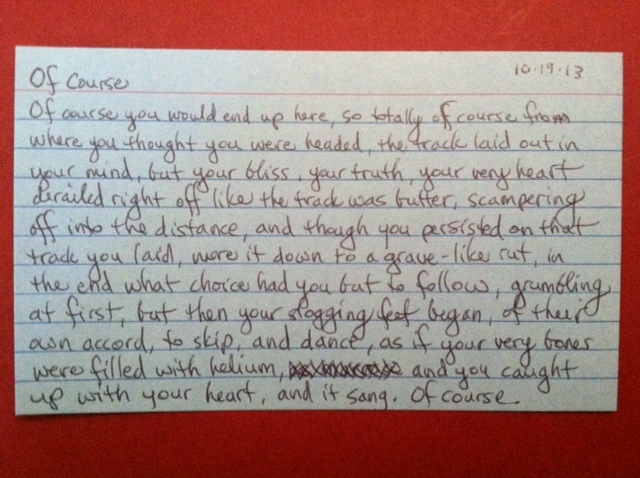 The word my pen landed on was “course,” preceded by “of.” From there I was off and running. I can’t say it’s unadulterated stream of consciousness, because I’m hyper-aware of the editor at work (the crossed out section at the bottom is the only visible prof, but rest assured the editor was working throughout, mostly critically). This 3×5 practice is an interesting contradiction: on the one hand, I aim to let the words flow, unrestricted; on the other hand, I want to like what I write. I inevitably end up failing massively at one or the other, and often both, but that’s part of the point. This practice is so much about embracing imperfection, and as a self-declared imperfectionist (ie, a recovering perfectionist), I can use as much practice at that as I can get. I used to say I’d rather be roasted over hot coals than move house. 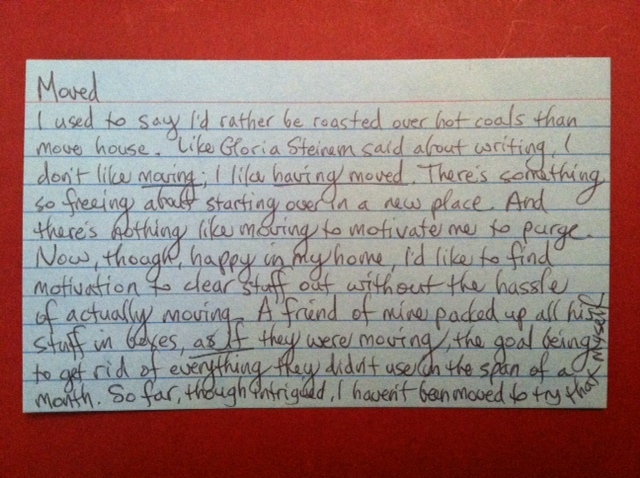 Like Gloria Steinem said about writing, I don’t like moving; I like having moved. There’s something so freeing about starting over in a new place. And there’s nothing like moving to motivate me to purge. Now, though, happy in my home, I’d like to find motivation to clear stuff out without the hassle of actually moving. A friend of mine packed up all his stuff in boxes, as if they were moving, the goal being to get rid of everything they didn’t use in the span of a month. So far, though intrigued, I haven’t been moved to try that myself. Today is one of those days when there’s nothing I particularly like about my efforts. This is okay! This is part of the practice! At least this is what I’m telling myself. I am choosing to trust the process. Two weeks ago, at Patti Digh’s Design Your Life Camp, I had the great fortune of taking a 90-minute writing workshop with ninja poet and writing teacher, Maya Stein. What a treat! My biggest takeaway from those way-too-short 90 minutes was the humble index card as creative practice. In other words, do a little bit every day, even if it’s just for a few minutes. You might be amazed at how even just a few minutes keeps your toe in the creative stream. For me, a tiny bit of time every day keeps my creative spirit happier and better nourished than a big chunk of time once a week. I confess I love to work BIG — full-body brush strokes on wall-sized canvases. But the fact is, the bigger the art, the more time and energy invested in creating it. That creates a lot of pressure! Even if I remind myself that there is no wrong (Creative Sandbox rule #1), and aim to stay focused on process, not product (Creative Sandbox rule #2), I still like the feeling of completing something and moving on to the next thing. 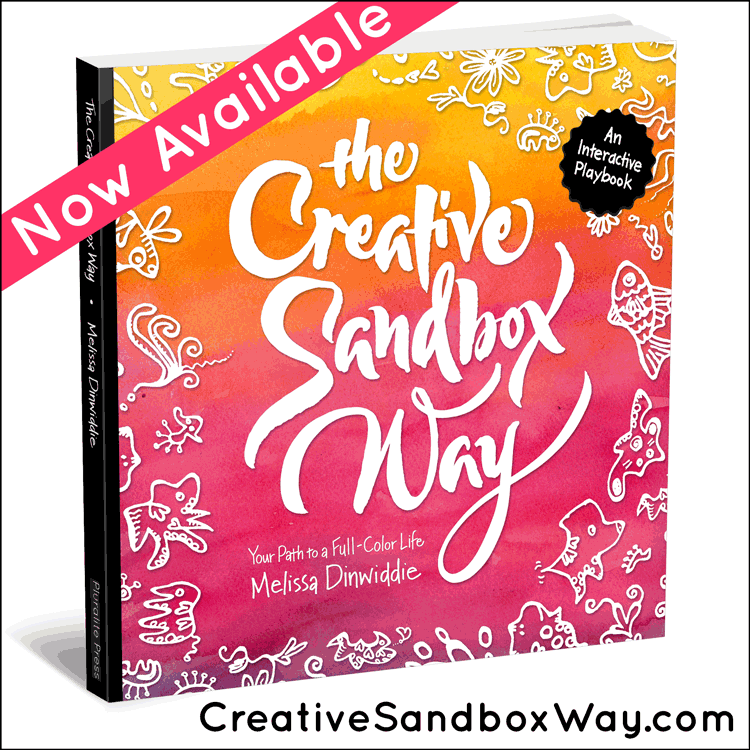 Thinking quantity, not quality (Creative Sandbox rule #3) makes me feel wonderfully prolific, which pleases me no end. 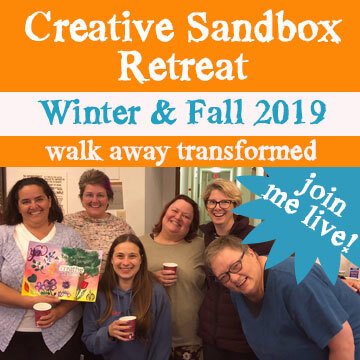 So after years of making a living creating largish artworks that require a time investment of dozens, even hundreds of hours, I started working small in my creative practice. My biggest ArtSparks are no bigger than about 8×10″, and some are as small as 1×1″. Tiny time goals and tiny size goals are easy to apply to my visual art, but until my workshop with Maya, it didn’t occur to me how tiny size goals might also work with writing. 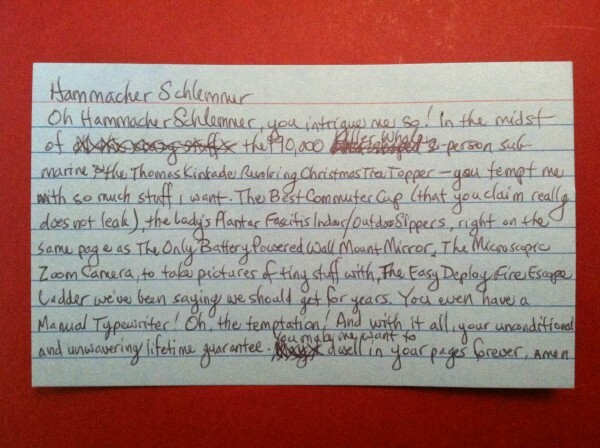 Enter the 3×5 index card. When Maya passed us each an index card, and gave us two minutes to write to a prompt, the proverbial lightbulb over my head went wild. Here it was — exactly the container I needed to apply think tiny and daily to my writing life! Since the day after I came back from Design Your Life Camp I’ve started each morning scribbling words on a 3×5 card. 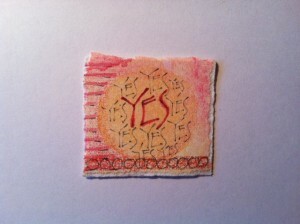 This past week I’ve started posting the cards on my Facebook page. And today I’m trying out posting them here, on the blog. 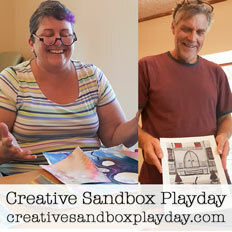 This is my new creative practice! All of this is great, but not without some not-so-great consequences. For example, I’m noticing already that knowing the cards will be shared makes me a whole lot more critical and less free while I’m writing them. But perfection is not the point! Impressing you is not the point! The point is to write. 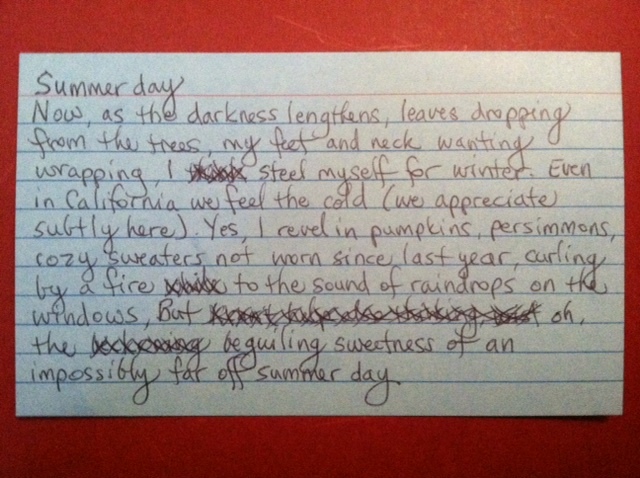 To commit to a writing practice that I can sustain. And sometimes side effects have their own positive consequences. For example, noticing that I’m becoming more critical and less free is helping me tackle those particular problems. The point is to write, and the point is also to practice allowing myself to make crappy stuff. I figure if I force myself to post whatever comes out in my tiny and daily morning 3×5 write, I will desensitize myself to the fear of judgment for putting stuff out in the world that is less than brilliant. And I also figure that if I maintain a daily practice, over time what comes out will probably get better. And, since my story about myself is that I’m a creator and builder, not a maintainer, I also figure that setting a ridiculously achievable goal — like a creative practice of a daily two-minute write on an index card — may help me change that story. My goal, then (and I can feel myself bust out in a cold sweat as I type this), is to fill a 3×5 index card every day for a year. I’m pretty scared that I’ll stumble. A whole year? Even with a ridiculously achievable goal, stumbling is very possible. Maybe even probable. In other words, I get to notice if I stumble, notice how it feels, remind myself that I’m human, and treat myself with lovingkindness, just as I would a good friend. I also commit to keeping in mind that the most important practice is just getting back on the wagon. Which is why it’s a very good thing to make it a very short wagon.